Now, when referring to Sustainable Development, it is essential to talk about the three pillars that support this idea: Environment, Economy and Society. 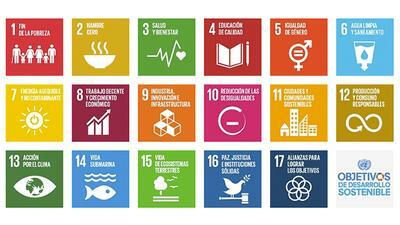 The SDGs are 17 outlined goals, though each has specific targets to achieve. Unlike the previous Millennium Development Goals, the SDGs involve all agents: the companies, the governments and the civil society, since it is understood as the only way to create a real, solid change which transforms society in all areas. Consumers, by acting responsibly and choosing brands that act towards any of the goals (remember that as a consumer, you vote every day, because every purchase is a vote). Companies, by implementing Corporate Social Responsibility (CSR) policies to act responsibly, without harming the environment with their actions or repairing the harm that might cause. With the SDGs, the SMEs and the startups can also act. Governments, with favorable policies that encourage actions oriented to meet the goals, especially at an entrepreneurial level. Investors, by investing in projects that reduce their inherent risks thanks to the reputation of sustainability and positive impact policies. What is important is to understand that SDGs were created to build a more favorable, collaborative environment for all, in which differences are curbed and where we all act for positive impact around us. It is not a label. It is not a patch. It is not a pose. It is not an imposition. They are common goals to create alliances between different agents in order to achieve a better world for all and not just for the few. So say the 17 SDGs. Energy is not just a basic and essential good. Energy is what has transformed the world over history. It is an Agent with a high impact on the society, on the economy and on the environment. An efficient management of energy consumption is a prerequisite for the economic sustainability of organizations. The production and use of energy represents two thirds (66%) of the global emissions of greenhouse gases according to the International Energy Agency (IEA). In addition, there are important social impacts related to energy supply, such as armed conflicts, migration crises, illnesses and premature deaths. At the moment, we are at a turning point in history. Communication technology and Internet technologies that exploit renewable energy resources and improve energy efficiency are developed and are largely competitive in price. Aprovechar su potencial nos ofrece la oportunidad de convertir el acceso y la generación de energía en derechos inalienables que contribuyan a la generación de oportunidades de desarrollo a nivel global (acceso a la salud y la educación) y a frenar el cambio climático. As upholder Jeremy Rifkin suggests in his book, The Empathic Civilization, energy models and communication systems are the catalysts for major social, economic and technological changes (revolutions) through history. The twentieth century witnessed the expansion of political rights and educational and economic opportunities for millions of people worldwide. Now, in the twenty first century, we must demand and contribute to universal access to a minimum amount of energy capable of spreading development opportunities to all. Education, health and the capacity for generating economic growth should become social and human inalienable rights.We all have the right and opportunity to generate our own energy locally and share it with others through regional, national and continental networks. According to the latest report from REN21 (Renewable Energy Policy Network) it is obvious that in order to move towards SDG7 it seems necessary to further and better plan in all territories and areas. In addition, complementary policies should be designed at the different stages of government in a close dialogue between the public and the private sectors; as well as build capacity both technical and political level. And this is the challenge ISENER wants to face. The challenge is urgent, the technology is largely developed and competitive; the key is, therefore, management and energy policies.